Q: What is Earth's "Georeactor"? A: The "Georeactor" is J. Marvin Herndon's putative naturally occurring nuclear fission reactor at the center of Earth that is the energy source and generator of Earth's magnetic field and energy source for surface "hot-spots", for example such as those powering Hawaii and Iceland. Q: What is the precedent? A: In 1956 Paul K. Kuroda applied Enrico Fermi's nuclear reactor theory to predict the occurrence of natural nuclear fission reactors in thick seams of uranium ore two billion years ago. 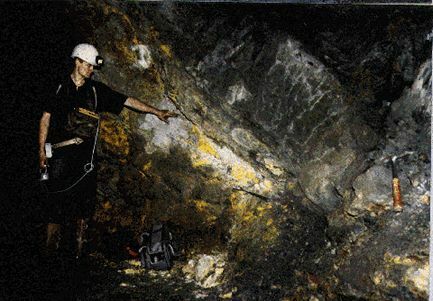 In 1972 French scientists discovered the fossil remains of such reactors in a uranium mine at Oklo, in the Republic of Gabon, pictured at right, that had operated just as Kuroda had predicted. Q: What observation gave rise to the georeactor concept? A: Beginning in 1969, astronomers discovered that three of the giant planets, Jupiter, Saturn, and Neptune, each radiate about twice as much energy as they receive from the Sun. Those planets each contain a powerful energy source, which presumably powers their atmospheric turbulence, and which was inexplicable until J. Marvin Herndon in 1992 demonstrated the feasibility of natural, planetocentric nuclear fission reactors as the energy source for those planets. The next step, a year later, was when Herndon, applying Fermi's nuclear reactor theory, demonstrated the feasibility of a nuclear fission reactor at the center of the Earth as the energy source for the geomagnetic field, illustrated at right. Q: What were the crucial underlying "keys" that were necessary to even begin to think about the possibility of the georeactor? A: These were the crucial "keys": (1) Substantial quantities of uranium exist in the Earth's core because the inner 82% of Earth formed under oxygen-starved conditions (click here); (2) Uranium would concentrate at Earth's center, because at those pressures density is a function of atomic number and atomic mass and uranium would be the most dense; (3) Fission products would automatically separate from uranium because they have about half the atomic number and atomic mass and therefore would be less dense than uranium; and, (4) Such a natural nuclear reactor would function as a "breeder reactor". Q: What is a "breeder reactor"? A: A breeder reactor converts U-238 into a nuclide that is more readily fissionable, such as U-235. Q: Why would the georeactor need to be a breeder? A: For the georeactor to function during the last two billion years it would have had to have been a breeder, otherwise the fissionable U-235 would have been consumed and/or decayed to too low a level, relative to U-238, by that time. Q: How could it be known that the georeactor would be a breeder reactor? A: At first Herndon assumed the georeactor would be a breeder reactor based upon the discovery that the natural nuclear reactors at Oklo had functioned in part as breeders. Later, that assumption was justified by calculations made at Oak Ridge National Laboratory using computer programs that had been for over thirty years developed and verified to simulate the operation of different types of nuclear fission reactors. Those calculations showed that the georeactor would function as a fast neutron breeder reactor over the entire time that Earth has existed. Q: Did anything else come out of the Oak Ridge georeactor calculations? A: Yes. Not only did the Oak ridge calculations verify all of Herndon's earlier calculations, but they yielded data on the fission products produced. Q: What was the most important information from the fission products? A: The Oak Ridge calculations showed that the helium isotopes, He-3 and He-4, would be produced in the same relative proportion as helium found in basalt extruded from within the Earth, as shown by the figure at right. For more information, click here. Q: So, the helium coming from deep within the Earth is evidence of the georeactor's existence? A: Yes. Since the 1960s, when the helium was first discovered, no one knew of a means for producing the necessary quantity of He-3 deep within the Earth, so it was assumed to be helium trapped since the time of Earth's formation. Now, the georeactor provides an explanation, a means for producing both He-3 and He-4 in precisely the range of compositions observed. Q: Why does the ratio of georeactor-produced He-3 to He-4 increase over time? A: The increase in that ratio mainly reflects the decrease in He-4 that results from uranium decaying and being "burned up". Q: Then is it safe to assume, when the He-3 to He-4 ratio rapidly become great, that the georeactor is nearing the end of its life? A: Yes. J. Marvin Herndon published that in the Proceedings of the National Academy of Sciences (USA) in 2003. For pdf click here. Q: Is there geological evidence for high helium ratios? A: Yes. High He-3 to He-4 ratios relative to air are observed in basalt from the Hawaii and Iceland hot-spots. Q: Do those observed high helium ratios portend the demise of the georeactor? A: The end of the georeactor's lifetime is coming. The question is one of time frame; there is great uncertainty as to when? Ten years? One hundred years? One thousand years? One billion years? At present, one cannot say with certainty. Q: Seismic resolution is not yet sufficiently precise to detect the georeactor. Is there any other possible means for detecting the georeactor? A: In principle, detection of anti-neutrinos, which rarely interact with matter, might verify the existence of the georeactor. But at present, detection is not directional, and from the few antineutrino "detection events", background and contamination must be subtracted, leaving yet unresolved questions about data corrections and interpretations. Antineutrino measurements, however, have not refuted georeactor existence, but rather have established an upper limit of 3TW (terawatts) on its energy production. 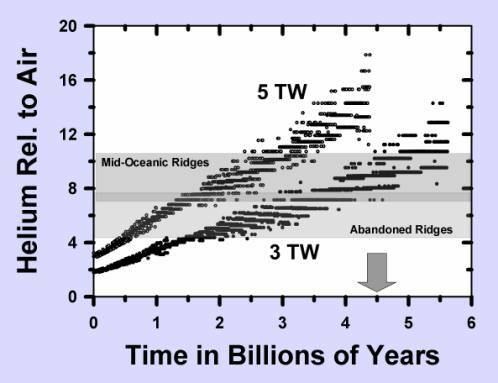 That 3TW figure does not include radioactive decay energy from the georeactor's uranium (and possibly thorium). Q: Is thorium part of the georeactor? A: The answer to that question is unknown. What is known, though, is that not much thorium can reside in the georeactor nuclear sub-core, otherwise it would shut down the nuclear fission chain reaction. The question is whether there is thorium in the radioactive waste sub-shell. Thorium at that location might gradually be converted to fissionable Uranium-233. Q: Why is the georeactor important to humanity? A: The georeactor is the energy source and generator of the Earth's magnetic field, which shields Earth from the onslaught of the solar wind. Q: Can the Earth's magnetic field be caused by a permanent magnet deep within the Earth? A: No. Deep inside Earth is too hot for a permanent magnet, i.e., above the Curie point, and interaction of the geomagnetic field with the solar wind and the matter of Earth drains energy, requiring a mechanism for generating the magnetic field and an energy source for powering it. Q: What mechanism produces the Earth's magnetic field? A: Generally, a magnetic field is produced by the flow of charged particles. There is only one known, practical mechanism for generating the Earth's magnetic field: In 1939, Walter Elsasser proposed the convection-driven dynamo as a means of generating the geomagnetic field. The idea is this: Convection currents in an electrically-conducting fluid are twisted by planetary rotation into a configuration that acts as a dynamo, a magnetic amplifier. Q: Since 1939, the geomagnetic field has been thought to be produced in the Earth's fluid core by that very mechanism. Is there a problem with that? A: Yes, there are serious problems. The first, relating to the need for an adequate energy source has long been known. The second, pertaining to convection was only recently discovered by J. Marvin Herndon. Q: One thing at a time. What has been the problem of energy source? A: The must be an energy source to power convection and that energy source must be located at the bottom of the fluid. Elsasser had suggested that uranium, being the most dense substance, would settle to the center of Earth and its radioactive decay energy (not fission) would power the needed convection. That idea was quickly dismissed because of the widespread, but incorrect, belief that Earth resembles an ordinary chondrite and that consequently all uranium would be as the oxide in the mantle or crust. 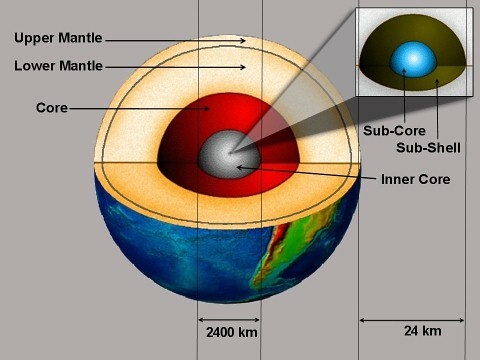 Belief that Earth resembles an ordinary chondrite leads to no central energy sources, so people made up an energy source based upon a series of uncorroborated assumptions, namely: (1) That the Earth's inner core is partially crystallized iron metal; (2) The core is cooling; (3) The inner core is growing by crystallization; and, (4) That the heat produced by crystallization does useful work, rather that just slowing the assumed rate of cooling. Q: OK. Clearly the georeactor solves the energy-source problem. What is the problem pertaining to convection? A: As recently discovered by J. Marvin Herndon, convection is physically impossible in the Earth's fluid core for two reasons: (1) Convection requires that the fluid-bottom be kept hotter than the top, meaning that heat brought from the bottom by convection must be efficiently removed from the top, which cannot be the case because the Earth's core is wrapped in a 2900km thick insulating blanket, the mantle, that has lower thermal conductivity, lower heat capacity, and higher viscosity than the core; and (2) Because the bottom of Earth's core, compressed by the weight above, is 23% more dense than its top, the small amount of heat-driven thermal expansion, less than 1%, cannot cause bottom-core matter to float to the top of the core, as required for convection. Q: But what about the high Rayleigh Number many have calculated for the core which is supposed to indicate that convection is possible? A: J. Marvin Herndon discovered that the dimensionless Rayleigh Number, published in 1916 by Lord Rayleigh, has been misapplied to the Earth's core and mantle. The Rayleigh Number was derived for an incompressible fluid, a fluid of constant density except as altered by thermal expansion at the bottom, which is clearly not the case for the Earth's core whose bottom is 23% more dense than its top due to compression by the weight above. Q: So, what is the implication? A: The implication is clear: Either the geomagnetic field is produced by a mechanism other than by Elsasser's convection-driven dynamo or there exists a region within the deep-interior of Earth where stable long-term convection is physically possible. Q: Is there a region in the deep-interior of Earth where stable long-term convection is physically possible? A: The georeactor consists of a uranium sub-core, which produces heat by nuclear fission, and a surrounding, fluid, radioactive-waste sub-shell where convection takes place. The fluid, radioactive-waste sub-shell is surrounded by the inner core, a massive heat-sink, that is surrounded by an even more massive heat-sink, the fluid core. Heat brought to the top of the georeactor sub-shell by convection is promptly removed by those massive heat-sinks, thus ensuring long-term stable convection within the georeactor sub-shell. Q: What effect does the radioactivity in the georeactor sub-shell have, if any? A: The convection-driven dynamo mechanism is a magnetic amplifier that amplifies a small "seed" magnetic field. The neutron-rich radioactive fission products assure a constant source of beta particles (electrons) whose motion can create "seed" magnetic fields to be amplified. Q: What was thought to be the source of the "seed" magnetic fields in the previous (incorrect) idea of convection-driven dynamo action in the Earth's fluid core? A: Generally, the necessity of "seed" magnetic fields was ignored; there is no readily apparent source of "seed" magnetic fields in the Earth's fluid core. Q: The major fear of man-made nuclear reactors is "melt-down". Does melt-down apply to the georeactor? A: Melt-down does not apply to Herndon's georeactor because the nuclear sub-core is already at the center of Earth. Melt-down is a serious problem for all copy-cat georeactors, assumed to exist at other points within the Earth's core, such as at the surface of the inner core, because all such hypothetical copy-cat georeactors would indeed melt-down to become Herndon's georeactor. Q: The geomagnetic field has been remarkably stable for long periods without reversals, periods as long as 40 million years. Can georeactor operation be stable? A. In the micro-gravity environment at the center of Earth, georeactor heat-production that is too energetic will cause actinide sub-core disassembly, mixing actinide elements with neutron-absorbers of the sub-shell, quenching the nuclear fission chain reaction. But as the denser actinide elements begin to settle-out of the mix, the chain reaction would re-start, ultimately establishing a balance, a dynamic equilibrium between heat-production and actinide settling-out, a self-regulating mechanism. Q: If the georeactor is so stable, how do reversals occur? A: External influences, Herndon suggests, intermittently disrupt the stability of georeactor geomagnetic field generation. For example, electrical currents induced by super-intense solar outbursts would cause heating in the georeactor sub-shell, possibly disrupting convection. Major trauma to the Earth might likewise disrupt convection in the georeactor fluid sub-shell. Q: When people thought that the geomagnetic field was produced by convection-driven dynamo action in the Earth's fluid core, no one suggested that electrical current induction by super-intense solar outbursts would destabilize Earth-core convection. Why? A: The answer is simple. The mass of the georeactor is about one ten-millionth that of the fluid core. Think of it this way: The direction and speed of a child's tiny, self-moving toy train can be changed much more rapidly and with far less force than that of the longest and heaviest, fully loaded, full-size freight train. Q: Is there geological evidence of very rapid geomagnetic reversals? A: In 1989, published paleomagnetic evidence from a lava flow indicated an episode of rapid reversal of six degrees per day. In 2010, that rapid-reversal result was confirmed by other researchers finding another instance of rapid change, a change of one degree per week. Q: Is the small mass of the georeactor consistent with a geomagnetic reversal occurring on a time frame as short a month or a year? A: Yes. That short time scale does seem possible because mass of the georeactor is about one ten-millionth that of the fluid core. Q: The long-term decrease in intensity of the geomagnetic field, coupled with the recently observed more-rapid-than-usual movement of the North magnetic pole toward Siberia, is thought by some to suggest that a reversal is imminent. Is that the case? A: It is not possible to say with certainty, but those observations might foreshadow a reversal; no one knows for sure. When? That is not possible to say, but, when it does happen, it might happen relatively quickly. Q: Is it possible that instead of a reversal, the geomagnetic field will simply fade away and never return. A: That will certainly happen when the georeactor burns out its supply of nuclear fuel. Whether or not there are one or more reversals before that happens is simply not known. For more information about Earth's nuclear georeactor, please click here.